Escrave is a non-judgmental addiction tracking web app, that allows you to study your own habits anonymously. I don’t collect any data about you, it stays on your device. Also, you don’t need an account to use Escrave, and don’t ever specify what habit you’re tracking! You could be tracking anything from a slight annoyance to a very serious addiction, so the app doesn’t make value assumptions about your actions, allowing you to determine the right goals for you. With hard data about your behavior in your hands, it’s easier to balance enjoyment with making healthy decisions. Give yourself a break every once in a while! Everything in moderation, even moderation. Escrave generates statistics and reports from your clicks describing your interactions with anything that you want to keep track of. The idea is to increase transparency by having precise information available to you about an addiction, to allow you to mitigate cravings and reduce spending and/or usage at a comfortable pace. By clicking the ‘spent’ button when you make a habit-related purchase, you can track how much you spend over time, how long it’s been since the last time you’ve spent money on your habit, and how long on average you wait in between purchases. Escrave also creates a breakdown for you of what you've spent total, this week, this month, and this year. By clicking the ‘Did it’ button when you do your habit, you can track the amount of time it's been since you last did it, and how long on average you wait. Simultaneously, escrave presents you with an option to click when you ‘Resisted’ doing it. This allows you to track the ratio between how often you give in to a craving versus successfully resisting a craving. Your body may already be subconsciously choosing not to give in to your cravings on a regular basis, without you noticing. Escrave makes it more obvious, by keeping a tally of how many cravings you've resisted in a row. 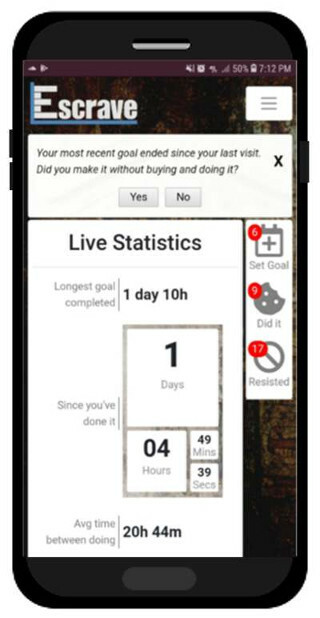 Escrave lets you declare goals, which subsequently start a countdown timer that you can refer to at any time to see the current amount of time left to wait until you can buy and/or do your habit. Every time one of your goals ends, the app will automatically add it to a list of completed goals showing the date ended and the total amount of time elapsed. Goals can be ended early, if you mark that you have spent money on your habit/done it. Goals can also be extended, by creating a new goal further into the future. Any amount of progress is still progress, so every ended goal is added to your habit log! 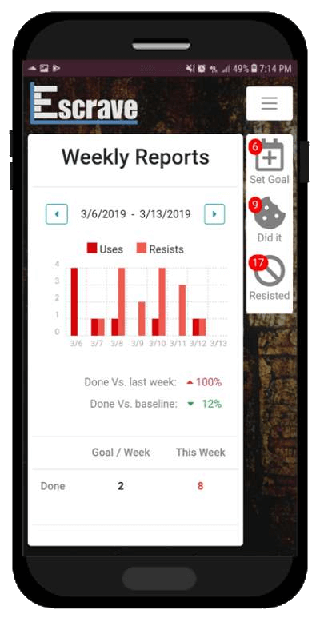 After you’ve been recording actions for at least a week, the app can generate a report based on what is important to you. You will be able to see a day by day breakdown of when you’ve resisted and given in to cravings, amount spent/done vs baseline, previous week amount, and initial goal amount. Escrave is available to use without creating an account and operates entirely on your personal device. This means that we do not store any of the data you create with it. Escrave does not even use analytics tools to get information about you. The data that users create is decentralized by nature, and completely unavailable to the maker of this app. Escrave stores data using something called LocalStorage, which is accessible only from your device, while accessing the site. As an added level of security and anonymity, you do not specify to Escrave what you’re using it to track. Even if somebody acquired your data, they would have no idea what it was about. Escrave was built this way to make it easier to be honest, as you are the only person judging yourself for how frequent you do or spend on it. Lying to Escrave is basically like cheating at solitaire. No matter how strong their resolution, people's habit(s) can start to get the best of them. If you're struggling to find something that you could track, this page has some common suggestions of addictions and bad habits that people use Escrave to track. This app can be used to track nearly anything you want to do/buy less often, however, it makes the most sense if you choose something related to a specific action. Try to think of something you do or spend more money on more than you would like. Are you a psychologically inclined writer, with a passion for cutting edge addiction/craving science? We are currently looking for talented bloggers to join our team!